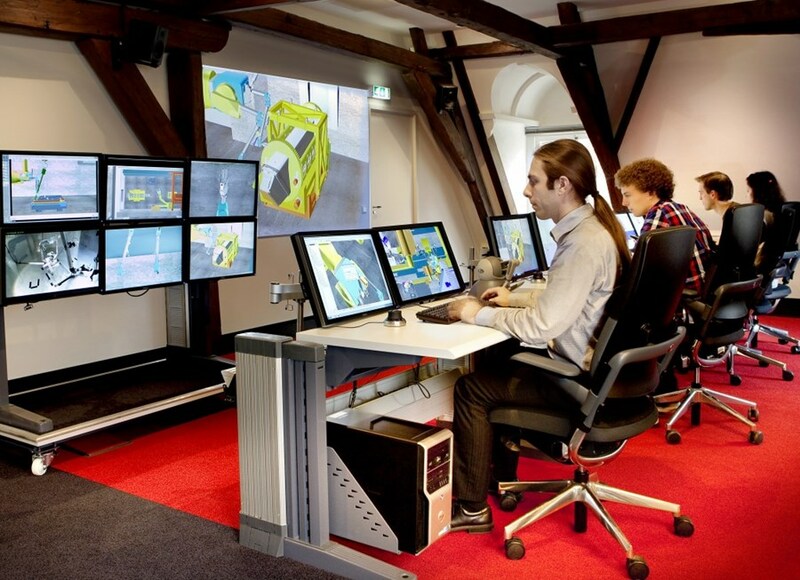 In the attic of an 18th century mansion in Rijnhuizen, central Netherlands, state-of-the-art virtual reality is being used to simulate remote maintenance procedures as they will take place in the ITER Hot Cell Facility. In the Remote Handling Study Centre (RHSC), a team of physicists, control engineers and remote handling experts are developing remote handling maintenance procedures for ITER components. RHSC—part of the Dutch Institute for Plasma Physics Rijnhuizen—was commissioned in March 2011. The ITER Tokamak has a unique and modular architecture for the replacement and maintenance of diagnostics, heating systems and first wall elements. For safe and effective remote handling, all maintainable ITER components will need to comply with a complex set of requirements and standards. 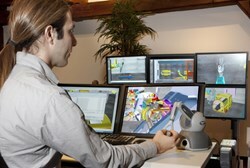 The RHSC at Rijnhuizen was created to study remote handling maintenance processes at various levels of complexity, from relatively simple procedure checks using snapshots in the CAD system ... to time studies using virtual reality animations and sophisticated operational sequence validation with multiple operators in real-time. The multi-operator facility mimics a remote handling work cell of the type that is presently foreseen for the ITER remote handling control room, where four operators will work together on a single maintenance scenario. In total, ITER plans to have up to twelve 4-station work cells. The virtual environment comes with a sophisticated physics engine to make its simulation as life-like as possible. All of the individual operators' computers are linked into their own operator-specific views within a single, shared virtual environment. The operators use 3D interface devices to manipulate objects in the virtual world. A smooth arc drawn with a desktop stylus, for example, is immediately translated into motion by the "slaved" robotic arm. The virtual environment comes with a sophisticated physics engine to make its simulation as life-like as possible: accidentally brush a free-standing object and it will teeter and even fall over and roll away. Other work stations focus on different aspects of the same maintenance task such as controlling the crane motion, adjusting camera views, or tracking and signing off the maintenance procedures for successful completion. Novel virtual reality technology creates a realistic setting in which the remote handling operators can interact with virtual ITER environments. A physics engine is used to emulate contact interaction in real-time and provide realistic haptic feedback. In RHSC, complex interactions between the operators and the control room software can be tested, task performance quantified, and operational resource usage estimated. The goal of the Dutch facility is to support ITER developers in evaluating the remote handling compatibility of component design. Plasma Physics Rijnhuizen is also a partner in the EFDA GOT program that aims to train the next generation of remote handling developers and operators. RHSC manager Jarich Koning explains: "After two successful assessment campaigns for an upper plug and an equatorial port plug, the team is eager to broaden its horizon and put the virtual robots to work on maintenance scenarios for other ITER components and maintenance activities." Careful planning of maintenance sequences can save enormous amounts of time and, during virtual test runs, any rough patches in the scenarios can be made apparent.